Best Ever Games to Review in Any Content Area! 1. I printed copies of all the unit tests (given to us by the district) in any content area (I used math and science). 2. I cut the tests into pieces with 1 question per piece and put all of them into an envelope along with the answer key to the test. 3. I prepared for the games below and planned to do 1 game using 1 set of questions each day for the 3 weeks leading up to the state tests. 4. Execution was simple! My kids loved these games and the kids were reviewing all the content areas without even realizing it! Some of these got a little wild, but that’s part of the disguise of the review (for some reason kids thing reviewing for tests always has to be ultra boring). 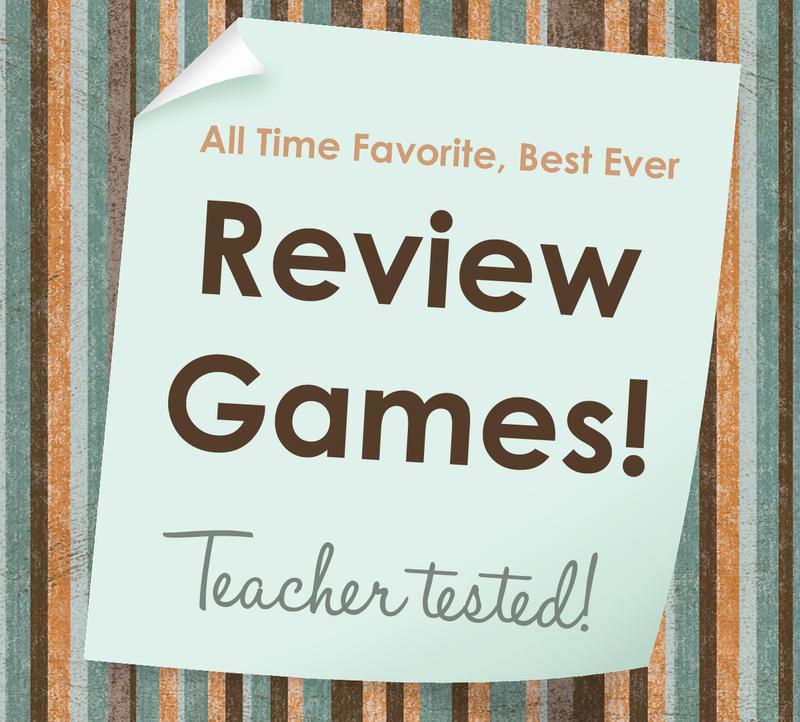 Some of these games were so awesome that my kids would even request their favorite game instead of learning a new one! *DART BOARD: set up throwing lines different distances from the dart board. Show a question. Teams try to solve it. The team that gets the answer right first may throw from the first line, team 2 gets to throw from 2nd line, etc. Team with the most points wins. *DICE GAME: Divide into teams. number on the dice represents the number of points for the question solved. Most points wins. *HUMAN TIC TAC TOE: Set up – 9 chairs in the center of the class in a tic tac toe formation. Divide into two teams (x’s and o’s). Everyone on each team gets a number (We had 8 on each team so numbered them from 1-8). Object – your team makes a tic tac toe before the other team. The teams stand to the sides, x’s on one side of the room and o’s on the other. Call out 3 numbers, (i.e. 1, 5 and 8)(Thus making 6 players, three x’s and three o’s). People with those numbers have to find the SM that I start reading. Once they solve it (you may choose to have them come to you and show you the answer) and run to a chair to start making a tic tac toe. The others join them as they solve it, trying to block the other team and jumping up and moving to try and get their own team into a straight line (3 in a row) (they can switch chairs as they please). Whoever gets the straight line first gets a point. They then go back to the side. Second round starts by calling out another 3 numbers and gives a new question. (keep track of who I had called so that everyone would get a few turns) It took about 20 minutes for everyone to have 4 turns. I let them help each other find the scriptures on the team. My non participators really got into it. Really gets the blood going. I had to make a rule that they couldn’t push someone off of a chair, but after that they were good! * MOVE ONE GAME: Give each team a set of 10 colored squares (2 of each color, so 5 colors). Place all of the game cards on the board in pairs (either one above the other or side-by-side). None of the card pairs should be matching colors. Read/show a question. The team that gets the question right first gets to switch 2 color cards (eventually making all color pairs match). *RACE TO THE CHAIRS. Set up 4 chairs (or one for each team) in the front of the room. Label each chair with a point value (20, 15, 10, 5). Show a question, and have the teams solve it. Once a team has solved it, a player from that team must write down the answer, run up to the chairs and sit in the highest point value chair. Once each team has a player in a chair, show the answers. If correct, the team earns the value of the chair; if incorrect, the team loses the value of the chair. Most points wins. This one was an absolute favorite! I even played this with my students in China and it was a hit! • Divide players into several teams (5 teams if possible). • Physically separate the teams and place a small table in the middle of the room. • Place these 5 point cards face up on the table. • Select one player from each team to be the team’s runner for that round. • The Clue Giver begins by giving a question. • As soon as the team knows the answer, the team runner must write it down then quickly move to the table and take one of the point cards and return to their team. The Round ends when all five teams have a point card or forfeit if they don’t know the answer. The teacher checks to see that answers are correct on each team. • The Teacher returns all cards to the table, selects new runners, and begins a new round. This entry was posted in End of the Year, Games, Math, Math Games, Science and tagged Children, Education, Elementary School, Kids, Teacher Resources, Teachers, Teaching by Squarehead Teachers. Bookmark the permalink.